In a bold and unprecedented move in the House of Commons, 382 Members of Parliament voted in favor of a technique that stops genetic diseases from being passed down from a mother to her child, with 182 members in opposition. This technique uses the DNA from two women and one man to “create” a baby with altered DNA. This alteration causes a permanent change in order to prevent a genetic disease from being passed to future generations. As a last legislative hurdle, the law was approved in the House of Lords on February 24th by a majority of 232. The introduction of such a law will launch the UK into a new frontier, and the surrounding debate has engendered skepticism and controversy. The technique, developed in Newcastle, aims to help families who want to have healthy children but are confronted with the obstacle of a genetic disease, such as mitochondrial disease. An estimated one in 6,500 babies in the UK are thought to develop a mitochondrial disorder, a serious health problem that can lead to heart and liver disease, respiratory problems, muscular dystrophy and blindness. The issue is that defective mitochondria are only passed to the child from the mother, so this technique uses a modified version of In Vitro Fertilization (IVF) to supplement the DNA of the two parents with the healthy mitochondria of a donor woman. Ultimately, the baby would only possess 0.1% of the donor woman’s DNA, and the process would completely eliminate the disease from passing down to future generations. If the law is passed, around 150 babies could be born each year utilizing this technique. A scientist works during an IVF process on Aug. 11, 2008. 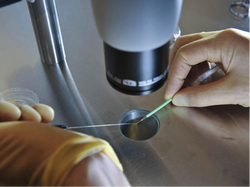 Proponents of the law, which amends the 2008 Human Fertilization and Embryology Act, believe it is an important step onto the frontiers of science and a long-awaited opportunity for families struggling with this issue. The Public Health Minister Jane Ellison is included in this group, as she believes it is “a bold step for parliament to take, but it is a considered and informed step.” The law’s supporters believe it falls short of being considered “genetic modification” because the mitochondrial DNA constitutes only 0.054% of a human’s overall DNA and none of the nuclear DNA that actually determines a human’s characteristics and traits. Those in favor of the law believe it is a wonderful scientific step for the UK in the realm of IVF treatments. The law is not without opposition, however. Opponents worry that families attempting the technique will be disappointed and let down because of the technique’s uncertainties should it fail. Others equate the situation to genetically modifying crops and believe that the approval of this law might create a slippery slope to allowing even further genetic modification of children. Strong opponents of the law include the Catholic and Anglican Churches in England. They do not support the law because they believe the technique involves the destruction of embryos. Others in opposition do not think the science behind the technique has been adequately proven and others argue about where to draw the ethical line, but now that the law has passed, it will still be up to the Human Fertilization and Embryology Authority to decide on a case-by-case basis whether or not the treatment can proceed. If a certain case is approved, the child born will not be able to discover the identity of the “third parent” donor. Now that the law has passed in the House of Lords, the next step is for the UK fertility regulator to develop and publish licensing rules for evaluating applications to perform this technique. By early October of 2015 the regulations are set to come into force, and the first babies could be born as soon as next autumn using the new technique. Critics caution that the law could open up the UK to dangerous precedents, but others applaud the brave new future of scientific discovery. Time will tell where this path will take the UK and whether or not other countries will follow suit in years to come. Laura Brodie is a 3L law student at University of Denver Sturm College of Law and a Staff Editor for the Denver Journal of International Law and Policy.